Citation: C N Trueman "Roy Chadwick"
Roy Chadwick is best known for his work designing the World War Two bomber, the Avro Lancaster. Chadwick’s Lancaster gained international fame after the success of the 1943 Dambuster Raid. Chadwick himself played a part in the raid, as he had to redesign the bomb bay to fit in the ‘bouncing bomb’ designed by Barnes Wallis. For his part in the raid, Chadwick was awarded a CBE. Roy Chadwick was born on April 30th 1893 near Widnes in Lancashire. He came from a family of engineers. During the day aged fourteen, Chadwick joined the British Westinghouse Drawing Office on an apprenticeship while during the night he studied at Manchester College of Technology (from 1907 to 1914). Chadwick joined the newly created A. V. Roe and Company in December 1911 where he was employed as the personal assistant of A. V. Roe himself. Chadwick was involved in the design of one of the most famous aircraft of World War One – the Avro 504. In1918, Chadwick was promoted to Chief Designer for Avro. He designed both civil and military aircraft but his emphasis seemed to be on bombers. Chadwick designed the Aldershot, the largest single-engine bomber of its day and the Manchester. In 1937, Avro was challenged by the Air Ministry to produce a long-range bomber powered by two engines. The end result was the Manchester. Capable of carrying a large bomb/mine load, the fuselage of the Manchester was made in five separate parts that were built at five separate factories before being transported to Avro’s headquarters in Cheshire for assembly. The ‘Manchester’ made its first prototype flight in July 1939 and the first operational squadron – No 207 – received its first Manchester’s in November 1940. The Manchester was powered by two Rolls Royce Vulture engines. They simply did not produce the power that Chadwick believed a long-range bomber should have. He designed a four-engine bomber that he wanted powered by the more powerful Rolls Royce Merlin engine. His new design was bigger in all areas that the Manchester and Chadwick convinced the Air Ministry that his design was an improvement. They agreed and the new aircraft was named the Lancaster. The Avro Lancaster proved to be a highly successful bomber. It took part in more bombing raids than any other aircraft in Bomber Command during World War Two. In total, 40,000 people were employed building the Lancaster, which served 35 RAF squadrons. Once the war finished, it soon became clear that the days of propeller-powered aircraft were numbered. 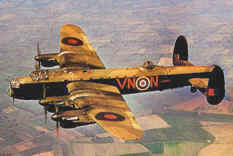 This meant that Chadwick’s Lancaster had reached the end of its operational life from a military perspective. Some post-war Lancaster’s were used for airfreight purposes while some were converted for carrying passengers. Chadwick had already set his sight on developing a long-range jet-powered aircraft. As part of his design work, between 1946 and 1947 Chadwick designed a delta-winged passenger aircraft that was later named the Avro Atlantic. Chadwick also designed the Tudor, the first pressurised airliner that played a part in the success of the Berlin Airlift in the early days of the Cold War.